The program’s latest creation is one installment in the rust for Public Land’s colossal “Our Park” initiative at the East Passyunk Crossing school. Mural Arts’ Restored program works on its latest creation — an untitled project featuring desks as the boxes of raised bed gardens in the front courtyard of Southwark. The artwork, an installment in the Trust for Public Land’s colossal “Our Park,” projects, aims to satisfy multiculturalism and environmentalism objectives. 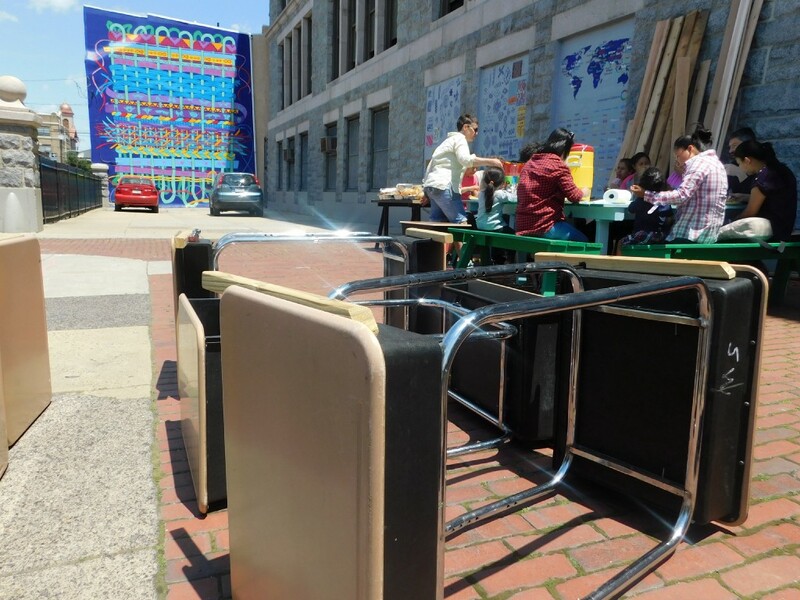 Shadowed by the kaleidoscopic shades of Southwark School’s latest multicultural mural, second-hand desks will soon encircle a community greenery on the corner of 9th and Mifflin streets. 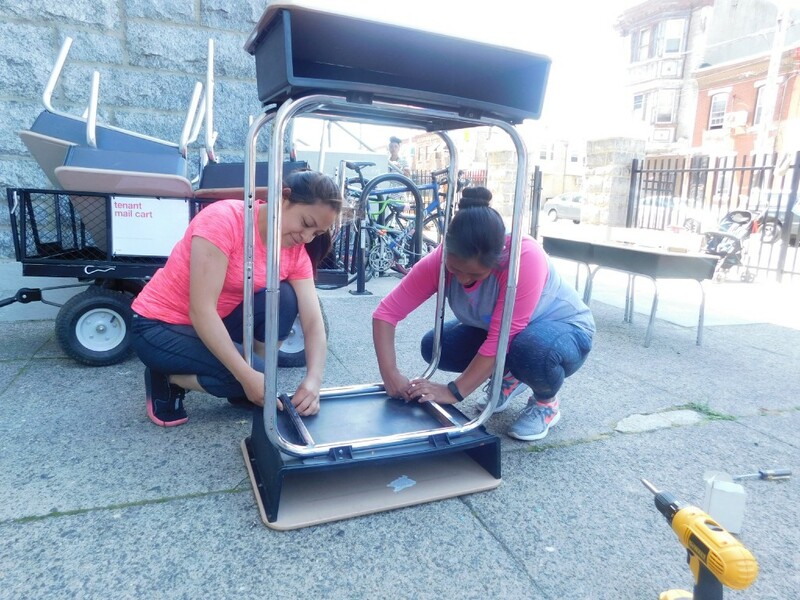 While the idiosyncratic circumference will certainly draw attention, the site emulates more than just an afterlife for discarded Philadelphia School District furniture, but rather acts as a hub for environmental justice and ethnic inclusion. A brainchild of Mural Arts’ Restored Spaces program, the beautification of Southwark’s front courtyard is the latest installment in the Trust for Public Land’s colossal “Our Park,” project — a multiyear placemaking initiative to create a safe and vibrant park in the school. A few years ago, the East Passyunk Crossing location was named a priority site in Mural Arts’ Playground for Useful Knowledge campaign to transform vacant and neglected urban areas into community spaces of engagement. Kicking off early this year, the front courtyard project — which is still untitled — includes the creative force of Basurama, an international arts collective aiming to repurpose trash and waste. Basurama-Madrid artist Manuel Polanco helps to build Mural Arts’ on its latest creation — an untitled project featuring desks as the boxes of raised bed gardens in the front courtyard of Southwark. The focal point of the project is the use of student desks as the boxes of raised bed gardens, which will be completed this week. Opposite the garden, a gathering space lined with benches will be completed in the fall along with larger planters and additional corresponding murals related to the massive, “Weaving Culture” opus. Chiefly, this patch of revamping strives to shed light on various forms of sustainability, specifically the significance of upcycling. Mural Arts connected with Basurama in February. The arts collective, which was founded in 2001, not only gives alternative artistic and and practical use to waste but also aims to manifest a linking platform of such ideas across around the world. The organization has created more than 100 projects across four continents and has established two representative offices — one in Bilbao, Spain, and another one in Sao Paulo, Brazil. This project was particularly designed by the Basurama Madrid offshoot. Ideally, this message will spill past the black metal gates of Southwark and into the streets of South Philly, as, already, local residents have helped to draft and, now, ultimately execute the project. From board gaming brainstorms to biweekly meetings, Mural Arts, alongside the Trust for Public Land, worked with not only students but their parents and neighbors in shaping the front courtyard. Aside from treasure hunts and memory activities, third-grade students played upon a giant board game based on cards against humanity. As cards were drawn, teams asked and answered questions. Mirroring the blueprint of Southwark School, the board encompassed sets of colored cards surrounding environmental, social and economic elements that were ideal to include in the design. “All the folks out front — they played the games and determined what needed to be put in that space, and now they’re building it themselves,” Hersh said. 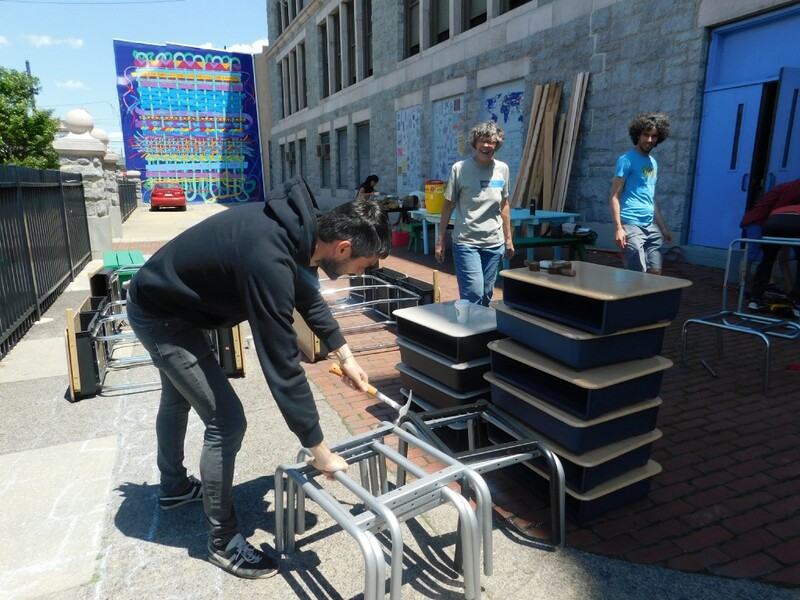 Residents of the East Passyunk Crossing Community help to build Mural Arts’ on its latest creation — an untitled project featuring desks as the boxes of raised bed gardens in the front courtyard of Southwark. Hersh says an interesting element of the meeting was the wave of translations amid discussions, as Southwark is home to close to a dozen languages. This satisfies yet another undertone of the courtyard — the celebration of diversity. Serving as such a multilingual school, Southwark’s ESOL staff helped to bridge the language barriers. Esther Lian, a Burmese-America bilingual counseling assistant at Southwark, says immigrant parents can often struggle with immersing into a new community, however, they’re willing face any intimidations. Chandra, who was helping to construct the desks, says she plans to tend to the garden every week, as the premise of the project is for the entire community to provide a helping hand. in this oasis of flowers and produce. Even though seeds haven’t been planted yet, community members are already dabbling into one another’s cuisine. Every day, at lunch time, a different participant will cook an authentic meal of their culture, inviting all the artists, carpenters and other volunteers to sit around a table and break bread.